Spitfires Mk. IX of No. 412 Squadron RCAF taxi for takeoff on a PSP-covered strip at B.88 airfield in Heesch, the Netherlands, 22nd March 1945. During the winter of 1944/1945, Heesch became the home of five Spitfire squadrons of the 2nd Tactical Air Force. Among them was No. 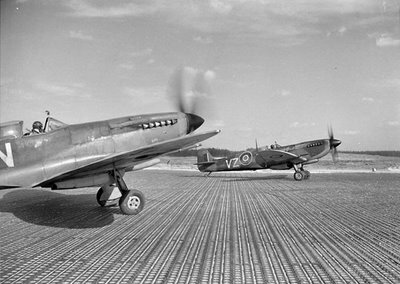 126 Wing RCAF which was stationed there between 6th December 1944 until mid-April 1945. Among the Canadian units was No. 412 Squadron, code letters VZ. The B.88 strip was characterized by abundant use of PSP (Pierced Steel Plank) surfacing due to the severe drainage and mud problems during the winter season. The characteristic “sandhill” in the background is a result of digging ditches at the periphery to get rid of the superfluous rain water – a primitive but apparantly effective form of drainage. My dad took off from airfield B88 in a Spitfire MK XIV on the 25th Feb 1945.After attacking a munition train near Haltern he was hit by 20mm flak in the engine and wing he flew to about 7,000 feet but the his engine seized and caught fire he lost height and baled out at about 4,000 feet he parachuted down into a field N/E of Heiden.He was captured by the Germans but managed to escape and was reunited with his squadron with the help of the Dutch resistance. His name William Stuart Harvey. I searched down google for info about PSP matting. I have bought 2 strips in good condition. Today I was in Heesch to buy it from a man who had the strips for a long time. They come from the airstrip your father flew from. On December 31, 1944, my dad, Robert Nevill Earle was attacking ground targets when his Spitfire was hit by flak. The aircraft spun into the ground and exploded. Needless to say, my dad did not survive. He is buried in the Reichswald Forest Cemetery near Kleve, Germany. If you have any other information about R.N. Earle please don’t hesitate to contact me. My dad also flew out of B.88 Heesch.